As you walk along the streets of the city this Friday, March 27, you may witness individuals or groups laying into the groove of recorded music or dancing along the urban cacophony of their neighborhood. It may also be that you have marked your calendar -or programmed your phone- with a reminder to leave your desk for 5 minutes and engage in a petit pas de deux with a colleague. Yes, it is dance anywhere® day! 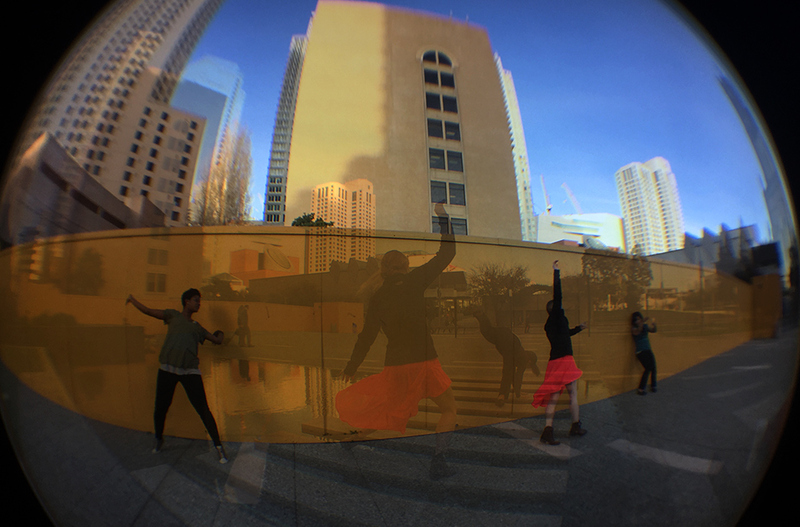 Scheduled at noon in San Francisco, 3pm in New York, 8pm in Paris and Rome, everyone is encouraged to take part in this “simultaneous worldwide dance public art performance,” as Bay Area artist and founder Beth Fein describes the event. Founded in 2005, dance anywhere® celebrates its 10th year anniversary. I talked to Fein over the phone last week. In The New York Times essay “Is Our Art Equal to the Challenges of Our Times” (November 2014), film critic A.O. Scott voiced his distress at the growing divide between the world’s turbulent affairs and the more placid topics that artists are instead choosing to focus on. To discuss artists’ social responsibility, Scott gathered a panel of individuals that mostly reflected his area of expertise and comprised filmmakers, singers and playwrights. Notably absent from the conversation were choreographers and visual artists. 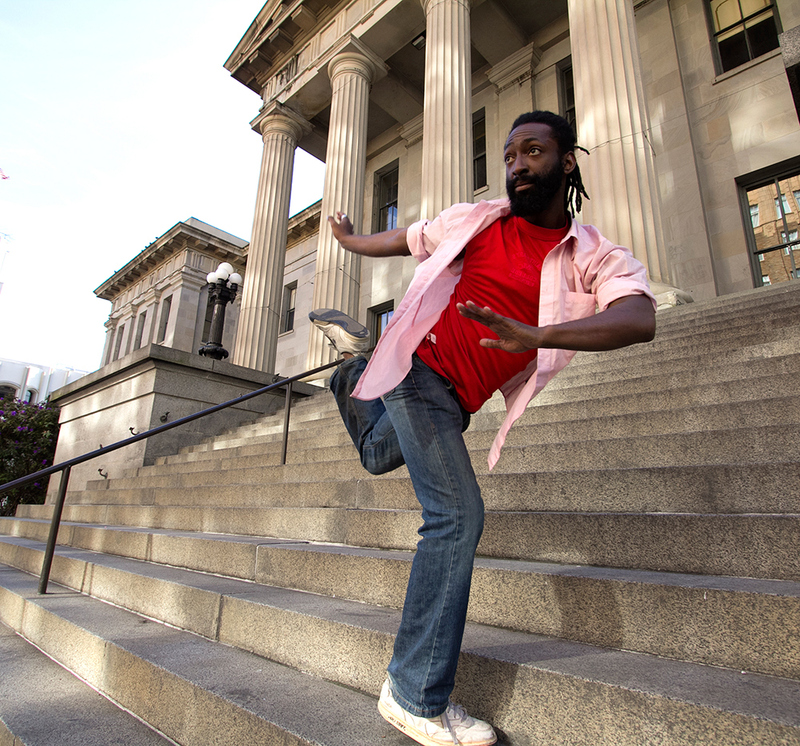 This evening’s program partly fills the gap and provides us with the opportunity to appreciate how the work of choreographers KT Nelson and Brenda Way, along with their visual arts collaborators, continues to respond to the social and political issues that Scott finds imperative for the arts to address. Inspired by Chinese activist artist Ai Weiwei’s artistic agenda, The Invention of Wings reminds us that freedom of expression continues to be challenged around the world, as evidenced by this year’s terrorist attacks on the French satirical weekly magazine Charlie Hebdo. Dead Reckoning, with its strident physicality invokes the careless impact of humans on the natural world just on the heels of NASA global statistics showing that 2014 was the hottest year on record. With an urgency that seeps through their carefully crafted kinetic language, the dancers embody these questions and invite us to reflect on the values that shape our lives. 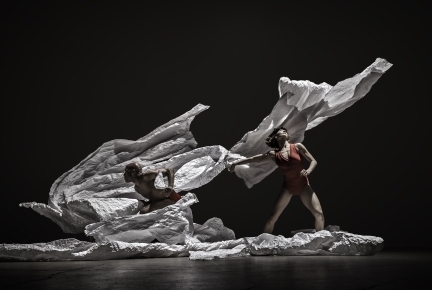 ODC/Dance Downtown at Yerba Buena Center for the Arts Theater through Sunday, March 22, 2015. For tickets, click here. This past January, on the occasion of Rita Felciano’s retirement, members of the dance community contributed their insights on the crucial role that the dance writer has played in the Bay Area. Choreographer and performer Chris Black remembered that Felciano encouraged her and her peer Ken James to create an evening of work together. Black took Felciano’s advice and collaborated with James to create The Adventures of Cunning & Guile, which won an Izzies for Best Choreography. “More importantly, the collaboration with Ken has been one of the most flat-out wonderful experiences of my dance career. And Rita saw that connection before we’d even figured it out ourselves,” Black wrote in InDance. The “critic as connector” is what New York-based poet and former New York Times dance critic Claudia La Rocco is championing in her curation of Platform 2015. 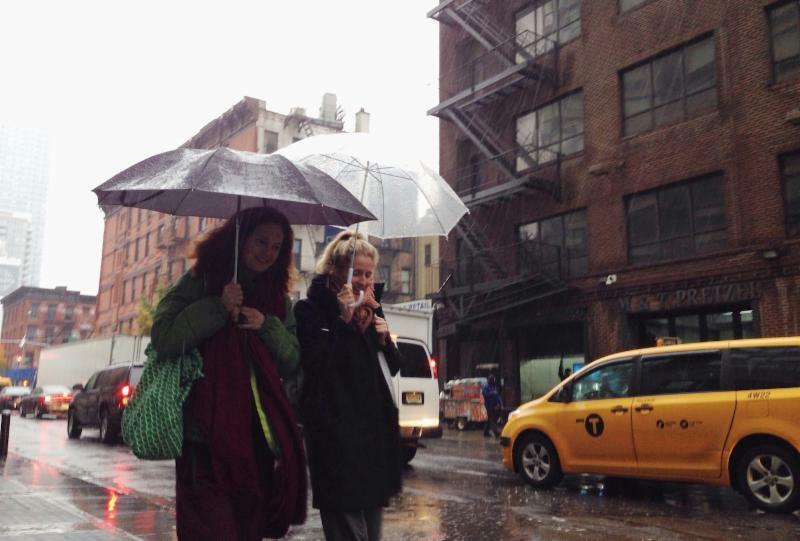 Platform is a recurring program at Danspace Project in New York where artists are invited to curate other artists. For this occasion, La Rocco created a series of “dance dialogues” between 12 artists “from New York City’s three nodal points of Balanchine, Cunningham and the Judson Dance Theater.” For one of the dance dialogues showcased last weekend –starts and fits, no middles no ends: 8 unfinished dances- La Rocco paired Sterling Hyltin, a principal dancer at New York City Ballet with Jodi Melnick, who has performed in the work of Trisha Brown, John Jasperse and Twyla Tharp; Sara Mearns, also a principal dancer at New York City Ballet with Rashaun Mitchell, a former member of the Merce Cunningham Dance Company. Although each artist was invited to converse with a partner assigned by La Rocco, the pairings spilled onto each other, allowing for moments when the four dancers joined on the dance floor and other partnerships formed – Melnick and Mitchell dancing together for example. What happens when you create a platform for ballerinas and contemporary dance performers to interact? Do they momentarily adopt trends from the other style? Can the conversation be more than a display of artistry side-by-side? What is the most productive context for a meaningful encounter to happen? The evening allowed the viewer to consider these questions, the in-progress and unfinished intent of the program providing directions rather than definite answers. As the title of the program indicated, there was no start, or rather there were a series of possible starts. As the audience was making its way in, Melnick, wearing winter boots, bright yellow leggings and a down feather jacket, ran in with her arms flailing, her feet heavily stumping the floor, and collapsed in semi-comical fashion face down in the middle of the space. After a few minutes, she got up and casually walked away. She repeated her awkward entrance and collapse a few minutes later. Mearns and Mitchell also entered the space during the pre-show, and fell to the floor, lying there motionless for a few minutes. Announced as the “prologue” in the program, the scene pre-set the space for what was to come. The gestures repeated later in the evening and one felt that the beginning was somehow of a flashback. With each entrance, the audience shushed, and when the dancers exited, resumed their conversation. This alternation of voices/silence, voices/silence, gave the impression that an emcee was playing with the sound volume -on and off, on and off- blurring the line between performance and quotidian life. La Rocco has gathered a cast of formidable performers, artists who hone their skills and are generously interacting in the intimate space of St. Mark’s Church. One of the most intriguing aspects of the evening consisted in witnessing how much the two ballerinas were venturing far from their familiar turf for the occasion, both literally and metaphorically. Per their lineage, Mitchell and Melnick are accustomed to performing in alternate and intimate spaces but it was quite unusual to be in such proximity with Mearns and Hyltin, who usually dance on the proscenium stage at Lincoln Center. At the beginning, there were a few stumbles when the ballerinas landed from a turn or a jump, prompting dance writer Wendy Perron’s tweet: “(post)modern dancers are more comfortable performing in intimate spaces than ballet dancers.” Yet Mearns and Hyltin’s curiosity and willingness to leave their comfort zone and embark on this experimental dance journey with Melnick and Mitchell offered a welcomed authenticity. Their closeness also exposed their vulnerability, fragilities and strengths, thereby giving them a humanness that is often eluded in traditional ballet. It was also interesting to look at Platform 2015 through the lens of the Bay area’s dance topography, where there is not such a great divide between “downtown dance” and ballet as in New York City. Some Bay Area performers navigate both worlds fluidly: dancer Katherine Wells has performed the work of contemporary ballet choreographer Amy Seiwert as convincingly as the work of modern dance choreographer Robert Moses. Dancing in silence for the vast majority of the 60-minute show, Mearns and Hyltin also momentarily “exited” the world of ballet by engaging in “downtown dance” process making. In a captivating “coaching scene” with Melnick, Hyltin revisited “the death of the poet,” a section of Balanchine’s La Sonnanbula (1946). Hyltin casually sat in the audience, with a microphone in her hand, and proceeded to coach Melnick in the role of the poet. Offering prompts inspired by ballet dancer Alexandra Kent’s memoir, her voice was assured and playful, provoking laughter in the audience. In this moment of transmission from choreographer to performer, she insisted on the emotional charge the dancer has to embody. Melnick was stunning and funny in her precise rendering of Hyltin’s dramatic cues. At some point, Hyltin left her seat to show Melnick what she meant. The original candle that the poet holds in Balanchine’s piece was replaced by the microphone that Hyltin held forward, giving the moment a postmodern veneer and a comical turn. It was interesting to note that what projects the voice -a microphone- stood in lieu of what illuminates the way for the poet in La Sonnanbula -the candle. Was it symbolic, the dancer hereby encouraged to own their artistic voice besides the choreographer’s? Or literal, a reference to a current trend in which more dancers are speaking on stage? Other ways of making were referenced -sometimes in half parody- during the evening. The program included a chance dance, which recalled the method largely used by Merce Cunningham, into which chance directs the choreographic process. For their chance dance, the four performers tossed a larger than life stuffed purple dice in the air. Two dancers were assigned a number that corresponded to a dance, while one dancer stood aside with the dice and the fourth dancer took the microphone to read excerpts from texts by dance artist and poet James Waring. These included statements such as “the new audience wants to see dancing not symbols… the new audience doesn’t want to see therapy in the theater.” Beyond offering material for critical consideration, these spoken words provided a poetic and humorous soundscape for the performer to inhabit the space. After the revisit of the chance dance and Balanchine’s piece, the evening nodded to dances that use a chair as a prop, and possibly to David Gordon’s Chair (1974). Mitchell stood still while his three partners successively put a chair on him as if it was a piece of costume – one chair around his torso, one around his neck, one around his arm and the last around his leg- Mearns, Melnick and Hyltin momentarily the aids tightening the costume of a matador before a bullfight. Mitchell’s range of movements was seriously cumbered by the volume and rigidity of the chairs, yet he managed to move with force, grace and inventiveness, adjusting to this shell of metal. Beyond offering a conversation between these 4 seasoned performers, the evening functioned as a trigger for interpretations and questions. La Rocco mentioned that “the artists [had] engaged with each other in person, via email and Skype, in the studio, and in residencies” for almost a year. I am curious about what brought the four dancers to choose the themes and images they conversed about on stage. How did the exchange they had off stage dictate the material revealed during the performance? What aspects of their partner’s experience did they retain, if any? Did the project and the proximity with a colleague from an “abutting world” influence their way of making? The New York City Ballet ‘s website describes La Sonnanbula as a story that “remains mysterious, inviting different interpretations of the characters’ actions and relationships; it is the moods and emotions evoked by Balanchine’s choreography that give the ballet its resonance.” Similarly, the relationships between the performers were at times elusive, but the performers’ command of their art and their openness to participate in a movement dialogue with a partner from a different dance lineage were captivating, proving La Rocco a perceptive connector between ideas, bodies and words.